PBR "Metalness" workflow in Blender. Possible? Hey guys! I have a beginner question as IM exploring Blender. Im about to get my first freelance job, and for the test I need to create a “metalness” PBR workflow. Although I know that it varies from PBR specular in some maps, how would I approach this in Blender? What is a good workflow, and what shall I think about? I will be using extensively Substance Painter for texturing, and do UVS, modeling, final texture in Blender. Ive only had a couple of days with it, so I apologize for this very crude question. Im very curious about the answers. PBR is really taking off, and some other users might get a hint in your answer if they are looking for this. The Principled shader is ideal for metalness as it handles roughness and metallic, vs the diffuse/gloss shaders. This shows you how to apply maps that may be created in something like substance Painter. Very kind of you. Now I have a much better idea about the workflow Im going to create for myself. Thank you! I would say, if you can afford the subscription, getting into Substance painter is a realyl great way of building up these PBR textures, it makes it a breeze to develop complex layered textures which you can then use in Blender. Yo! Stop the presses bros!.. Kristoffer, go into Painter and export a glTF 2.0 (or GLB)! Bring that pup into Blender, and be stunned and amazed (like I was) that all PBR nodes (metal/rough) are hooked up and ready to render in Cycles! I must be doing something wrong then, tried importing a gIFT 2.0 and it didn’t work, textures were not pulled in with the mesh. You have to export the mesh in that format and I also extracted materials in the same folder under giFT. I dont know if you need to export the materials as well, Ill check that. It works perfectly. @norka It works perfectly now. I got it working!!! Thanks man. We are forever thankful. Very cool! You have to export the mesh in that format and I also extracted materials in the same folder under giFT. By this do you mean mesh & images in the same folder, or images in a “giFT” sub-folder from where the mesh is? I have the former but the material images still didn’t pull in. EDIT: Never mind, figured it out, have to ensure the textures are exported in gtb form. Though a “gotcha”, the blend mode setting of the material came in as alpha blend, which made it look odd, need to have it set to opaque. You’re welcome K! glTF 2.0 is the shizz. I freakin’ love it. Opaque? Hmm.I didnt have that issue. What maps were included in the save? No I just imported it and it went perfect. I think it’s becasue I had saved my settings with the alpha-blend set from doing some stuff with HardOps in 2.80 which used glass as there was no opacity map exported. Even though there was no opacity, Eevee was doing some funky things with the mesh visibility until i set the blend mode to opaque. Go look at the glTF 2.0 spec. All your answers are there. https://www.khronos.org/gltf/ … It is an incredible format that is built from the ground up for PBR and is becoming the standard for WebGL. I would not be at all surprised if it became to 3D what JPG or PNG is to 2D. And if you can’t find your answers on Khronos, track down Don McCurdy and ask him. He is on the glTF team and is all over the friggin’ place. He’s Johnny-on-the-spot with help, tips, etc, with anything glTF related. He da man! Its a very favorable file extension for 3D my man! @norka hey! Did you hear about that addon so you can manipulate sbsr parameters in Blender? It solves and extends its functionality if you ask me. 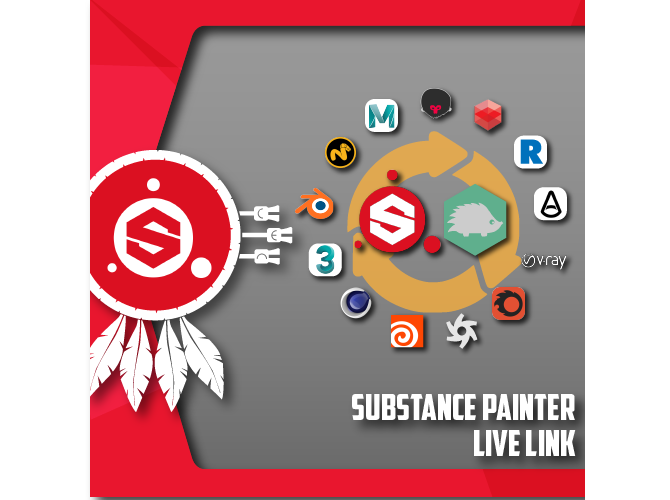 HHConnect it’s actually called Substance Painter Live link, I have it and yep, pretty much plug N play. You just have to select the “hh_” version of the material, once you’ve done that, changes in Painter can be updated in blender automatically.